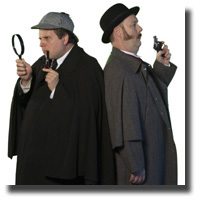 There have been numerous manifestations of Sir Arthur Conan Doyle’s celebrated fictional pairing of Sherlock Holmes and Dr. John Watson through books, film and television. They range from the preposterous Without a Clue that saw Michael Caine playing a feckless Sherlock Holmes and Ben Kingsley as Watson, to the current television series Elementary with Jonny Lee Miller as Sherlock Holmes and Lucy Liu as Watson transplanted to New York City in the present time. However, Sherlock Holmes conversions to the theatre stage have been rare. This production owes nothing to any of Doyle’s writings, but entirely conceived by Jahnna Beecham and Malcolm Hillgartner as a ludicrously musical spoof on the intrepid crime-fighting duo. The unctuous title is redolent of a bloated premise that has more twists and turns than a downtown bike lane. The opening scene has more to do with music hall than musical theatre, with Chris Robson and Damon Calderwood getting into a vaudevillian style song-and-dance routine. The rest of the show is just as camp with Gordon Roberts as the perfect foil for Calderwood’s way over the top super sleuth. The pair are impeccably tuned to each other’s movement, dialogue delivery and singing. Beecham and Hillgartner’s tunes strewed throughout the show, are hardly memorable, but provide an agreeable level of entertainment. Not all serve to drive the narrative arc (such as it is) however; Roberts’ droll rendition of “I haven’t a clue what the game is” (may not be correct title) acquaints the audience of his adjuvant relationship with his partner, while “Hookah,” that opens the second act is a throw-away number that is there for the laughs. Off at stage left, Chris Robson (who also steps out as Freddy Fish and Professor Moriaty) on piano and Renée Bulat on violin provide supple support for Roberts and Calderwood’s well-blended voices. Rita Arhipov deserves kudos for her busy, yet well constructed set that commonly serves as Holmes Baker Street rooms, the Gaiety Music Hall and an outside ally. The show ended appropriately with a final Roberts and Calderwood duet “My True friend” that is perhaps indicative of both their off-stage and on-stage friendship.